1.6.3 英語放送スクリプト編: JR西日本-山陽・北陸新幹線 接近時の英語放送 - dutcheez’s Fun with English! Ladies and gentlemen, welcome to the Shinkansen. The superexpress Sakura 5-6-2 departing at 17:48 bound for Shin Osaka is arriving at track 14. Please stand behind the yellow line on the platform. This train has eight cars. Car 8 is at the front of the train, and car 1 is at the rear. The Green Seats are in car 6. Cars 1, 2, and 3 are for passengers without seat reservations. Smoking is not allowed on this train, except in the designated smoking rooms located in cars 3 and 7. Please refrain from smoking in the train including areas at either end of the cars. This train will be stopping at Fukuyama, Okayama, Himeji, and Shin Kobe before arriving at Shin Osaka terminal. Thank you. 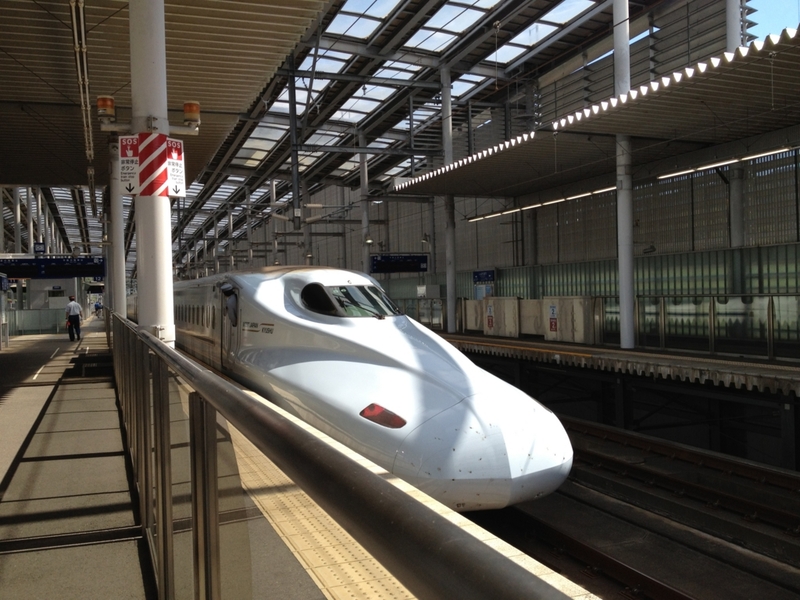 The Hakutaka 561 (five-six-one) departing at 14:02 (fourteen oh two) bound for Kanazawa is arriving at track number 2. Please stay behind the automatic platform gates. Cars 1 through 4 are for passengers without seat reservations. This train is completely non-smoking. Please refrain from smoking anywhere on the train, including areas at either end of the cars.